Every year, usually between gooey mouthfuls of sweets, I find myself lamenting that the concept of putting “Halloween” and “healthy” together doesn’t seem to garnish enough interest. The most popular focus of Halloween definitely seems to be the spooky factor, and yet sugar finds its way into everything. For example, take even a quick look at Halloween recipes available (online or in magazines/books), and you will find all manner of creepy looking creations; witch’s fingers, worm-ridden dirt cups, bleeding Jello hearts, kitty litter cakes, etc. (Many of those “recipes” are nothing more than covering a pre-prepared sweet with pre-prepared frosting or meltable chocolate, but I’ll save that topic for another post.) Finding one of those recipes that isn’t made of 90% junk ingredients is a lot more difficult. People want to have their freaky Halloween foods, but the resources to help us make those recipes a bit more healthy can be difficult to find. We all want to eat and feel better, but don’t want to compromise very much on taste. As the owner of a sweet tooth (or rather, a whole mouthful of them), I totally relate. Hopefully this list will help get you thinking outside the box and inspire some new Halloween recipes that are creepy, delicious, and healthy. These include whole foods, which are naturally colored in vibrant Halloween shades and contain long lists of essential nutrients. To preserve the most color, nutrition, and flavor, try to keep cooking to a minimum. If you can’t serve an item raw, just lightly steam or bake it. When baking, try alternative sweeteners to white sugar. This will help you reduce the Glycemic Index, calories, and the “sugar high” that ends in a blood sugar crash (which contributes to fatigue and over-eating, among other things). I prefer fructose, as you don’t need to change up a recipe too much to substitute it in there, and it behaves very much like sugar. Another easy way to add some nutrition to a baked recipe is to use flours other than white wheat. I almost always use a 50/50 mix of spelt flour and whole wheat flour, and the taste and performance is almost totally unnoticeable. There are many other kinds of non-wheat flours available as well. Create homemade meals and treats whenever possible. Pre-packaged and fast food is loaded with sugar, chemicals, trans-fats, sodium, artificial colors & flavorings, etc. Drink plenty of water. We often mistake thirst for hunger (especially when eating too much sugar), which causes us to over eat. Use frozen vegetables instead of canned to cut sodium and increase flavor and nutrition. Avoid all artificial chemical sweeteners, all of which fall into 2 categories: either we don’t have nearly enough long term information on it, or it has been documented by the FDA to promote numerous health problems. Your health is too precious to risk on a product that might be deadly, and there are excellent alternatives, like Stevia. 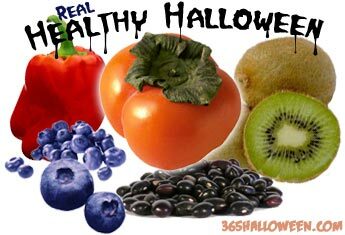 What are your favorite healthy Halloween recipes and tips? Please leave your suggestions in the comments! Subscribe to comments with RSS or TrackBack to 'Healthy Halloween Ingredients & Tips'. 365 Halloween Response: Check out our new article that shows various ways to present raw veggie platters.